The Flag of Scotland is a white X-shaped cross, which represents the cross of the patron saint of Scotland, Saint Andrew on a blue field. 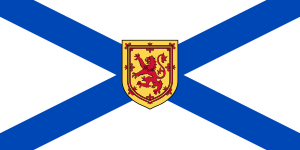 The flag is called the Saltire or the Saint Andrew's Cross. Material evidence of the saltire's use dates from somewhat later. In 1385 the Parliament of Scotland decreed that Scottish soldiers should wear the saltire as a distinguishing mark. 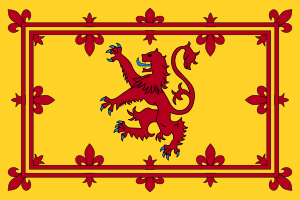 The earliest surviving Scottish flag consisting solely of the saltire dates from 1503: a white cross on a red background. By 1540 the legend of King Angus had been altered to include the vision of the crux decussata against a blue sky. Thereafter, this saltire design in its present form became the national flag of Scotland. There are five flagpoles outside the Scottish Parliament Building in Edinburgh. The Saltire is flown every day, alongside the Union Flag and the EU Flag. The fourth flagpole is used for special occasions such as Commonwealth Day and United Nations Day. The fifth pole is used for the Royal Standard. The Flag can be flown at any time by any individual, company, local authority, hospital or school. There is no need to have planning permission to fly the flag from a vertical flagpole. This page was last changed on 26 November 2014, at 14:23.